An interview with First Solar CTO Raffi Garabedian scratches the surface on bandgap grading. Dozens of solar startups have promised silicon performance at thin-film prices. First Solar is actually doing that today. Modules built at the company's Malaysian facility currently have a cost of less than 40 cents per watt, according to the firm. GTM has suggested that First Solar's technical progress of late is owed to its acquisition of GE's intellectual property. "We owe a great deal to the acquisition of GE's IP," said Garabedian. "It opened our eyes to a new vein that we're mining together. But the GE IP alone does not explain the trajectory." "There are two pieces to this puzzle. There's material and device science. But the other piece is manufacturing know-how and scaling. We have the code right on that second piece -- scaling to a full-size module and then scaling to production throughputs." "The physics we're exploiting is bandgap grading, much like what is done in the CIGS material system," said Garabedian. The company asserts that "grading in CdTe promises to be much more effective than in CIGS." The CTO explained, "You can substitute tellurium with another element, so you build a ternary compound, a substitutional ternary." He adds that the process doesn't involve new capital equipment and still deals with materials that sublime in the vapor transport deposition process. "We compound the material offline [and] make powders, and can precisely control the composition." "Note again that we’re doing all this using our already established manufacturing equipment and processes. Not to say that the changes are trivial (in some cases, we’re having to make substantial upgrades to maintain throughput,for example), but it's important to note that we’re not giving up the supreme manufacturability of our process, which has enabled our low-production-cost profile." 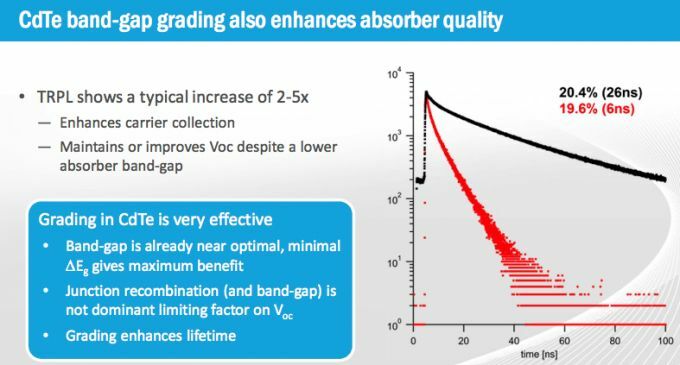 "Bandgap grading allows us to enhance red absorption. Red photons above 860 or so nanometers in wavelength were inaccessible to CdTe. With a reduction of the material bandgap toward the front of the device, those red photons can be absorbed and converted, contributing about 2mA/cm2 in the quantum efficiency curve illustrated. Along with the red absorption, you also see the other side of the QE (in the blue) flatten out nicely. This is due to an enhancement of our window layer, which used to absorb blue light more readily than it now does -- and that contributes another 1mA/cm2 in the illustrated example." 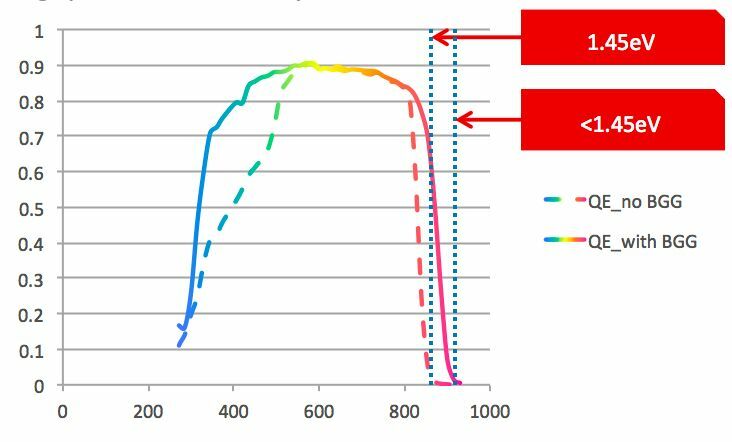 Garabedian added, "The same trick of graded bandgaps also has the effect of improving defect passivation in CdTe," noting that the lifetime of the materials is superior to the ungraded materials. 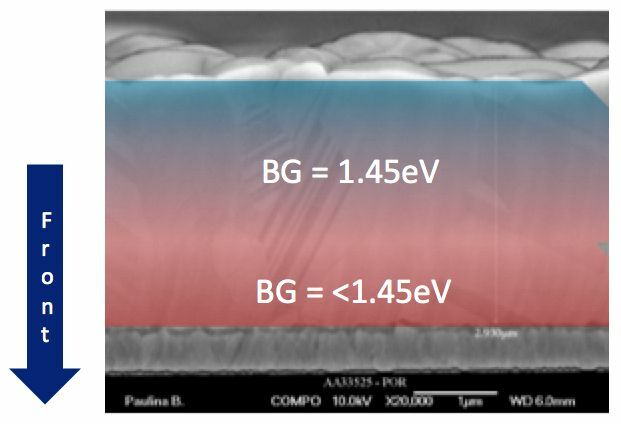 The CTO also observed an improvement in open-circuit voltage in the graded band gap device. Garabedian said, "We've come to the realization that we're no longer low efficiency, low cost. We actually have excellent performance. I don't think the marketplace appreciated this. We've finally gotten to the point where thin film is showing its potential." He continued, "Our rate of improvement is far better than what we’re seeing in the silicon field." 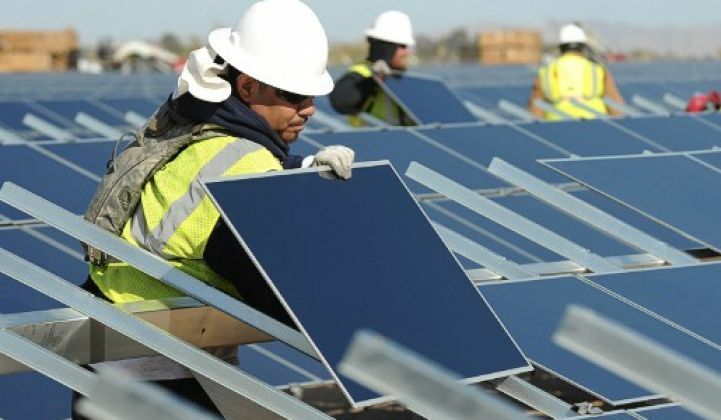 Nick Strevel, First Solar’s senior manager of technology, said that First Solar’s CdTe product will provide up to 8 percent more useable energy from the same land area compared to multicrystalline silicon. Garabedian acknowledges, "CdTe has always had a couple of meta-stabilities." The material goes through an initial degradation in efficiency and then it stabilizes. "A lot of what we focused on in the last few years was to reduce that effect by working on degradation programs with lots of collaborative efforts to understand degradation mechanisms in CdTe." He added, "We nameplate that out, anyway -- and we don't sell to the flash test." He clarified, "Even though our initial degradation is quite low now, we still apply a performance margin to the nameplate, effectively down-binning so that any degradation is compensated in the module rating." "Anyone in the c-Si world can lean on process, material and equipment vendors around the world. They end up being an integrator. On the other side of that coin...it's an industry that's well understood. There's not a lot of room for differentiation." "The differentiation we've shown is an efficiency ramp three times that of our competitors. That is an opportunity our competitors don't have," he said, adding, "I can tell you where my competitors are going to be in a few years. You can't do the same with CdTe -- we're making discoveries everyday that no one can predict." Garabedian pointed out that First Solar's $140 million annual R&D spend was twice that of high-efficiency silicon SunPower's R&D budget in 2014, and $50 million higher than Yingli's spend. "Our goal is to be far ahead of c-Si in a few years from an efficiency and manufacturing [standpoint]," said the CTO, acknowledging that translating this 18.6% efficiency to full production is "going to take years."